Angiogenesis has been identified as a crucial process in the development and spread of cancers. There are many regulators of angiogenesis which are not yet fully understood. 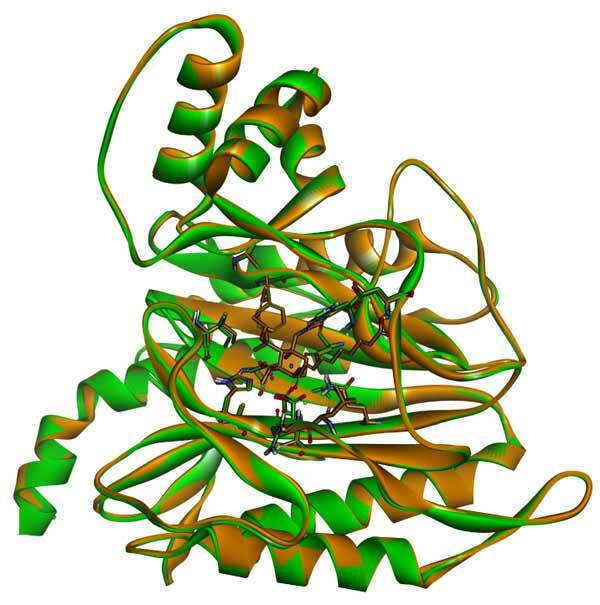 Methionine aminiopeptidase is a metalloenzyme with two structurally distinct forms in humans, Type-1 (MetAP-1) and Type-2 (MetAP-2). It has been shown that small molecule inhibitors of MetAP-2 suppress endothelial cell proliferation. The initial discovery by Donald Ingber of MetAP-2 inhibition as a potential target in angiogenesis began with a fortuitous observation similar to the discovery of penicillin activity by Sir Alexander Fleming. From a drug design perspective, MetAP-2 is an attractive target. Fumagillin and ovalicin, known natural products, bind with IC50 values in low nanomolar concentrations. Crystal structures of the bound complexes provide 3-dimensional coordinates for advanced computational studies. More recent discoveries have shown other biological activities for MetAP-2 inhibition, which has generated new interests in the design of novel inhibitors. Semisynthetic fumagillin derivatives such as AGM-1470 (TNP-470) have been shown to have better drug properties, but have not been very successful in clinical trials. The rationale and development of novel multicyclic analogs of fumagillin are reviewed. ADME, Angiogenesis, Angiogenic inhibitors, Anti-angiogenic compounds, Cancer, Drug design, Fumagillin, Methionine aminiopeptidase, MetAP-2, Ovalicin, Pharmacophore, Cancer, TNP-470.